The protestors who were arrested on Constitution Avenue late yesterday, who are becoming known as the “DC 41″ or the “DC 41 for 51,” were released late last night after a lengthy processing by the US Capitol Police. While several chose to pay the $50 fine (some paying $51 as a symbolic gesture), others will appear in Superior Court on May 5th to fight the charge. The protest yesterday drew hundreds of District Residents angry that the city’s financial process is hamstrung and bargained with by a federal government that the city has no say in. As the Mayor and Council called for budget autonomy for the District, and the crowd cheered their approval, the USCP one by one arrested the protestors, councilmembers and council chair and finally the Mayor. Included among those arrested were: CM Bowser, CM Alexander, CM Wells, CM Biddle, CM Michael Brown, Council Chair Kwame Brown, and Mayor Vincent Gray. 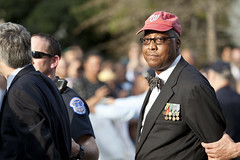 Pictured above is Ward 5 activist Robert Vinson Brannum, being arrested. The move yesterday could either be the start of a new movement to earn the District the same rights as other American cities and communities, or it could be a one-off publicity stunt that is lost and forgotten in the next few weeks. Everything depends on how the city leaders approach what comes next. If the city and its leaders were to get serious about local autonomy, this would be a memorable day, and one that could easily vault Gray to re-election in four years. If it’s forgotten or lost among the rhetoric of broken words and politics, then this day will be another punchline for years to come. We’re at a turning point here, and the city can either remain a federal fiefdom, or it can begin to free itself from the undemocratic conditions in which its 600,000 citizens labor. I have seen many people express some support for the voucher program that Speaker Boehner has reinstated, but having programs like this forced on the city by federal fiat is no way to go through life. We saw what happened in 2009 when the President was inaugurated. This is what happened next: the funding was unceremoniously cut, and those students were not allowed to finish their programs. That sort of spin-down of a program is all we can expect when we have no voting representation: Congressional control of our purse strings serves only to treat us as a bargaining chip and experimentation ground, with no accountability from the people that it affects. So, DC, is it time to organize and fight? Or is it time to lay down after a ceremonial protest?